Hunter x Hunter: Greed Island Final is the third (and hopefully not the last) of three Hunter x Hunter OVAs. It continues off where the Greed Island OVA left off, with Gon and Killua in the Greed Island game. I might as well get it out of the way and say that the art and sound are exactly like what you\'d expect from the previous OVAs and the 62 episode Hunter x Hunter episodes. Serviceable, great action scenes, and everything the watcher is already used to. Killua does get cuter in this OVA but maybe that\'s just me getting attached to his character. The ending theme of this OVA is really good, which bumps the sound score up a notch. It is titled \&quot;Moshimo Kono Sekai de Kimi to Boku ga Deaenakatta Nara (If You and I Never Met in This World)\&quot;. I am still not 100% sure who the song is referring to. Is it Gon thinking about his father? Killua thinking about Gon? Or some other characters (Leorio?). The character development in this OVA is, dare I say it, even better than I expected (and I had high expectations!). For a while, our 2 heros train under Biske (Biscuit? ), who may look young but is an even better trainer than their previous nen teacher, Wing. That is to be expected because, well, she outranks him (watch and find out). The training episodes are a lot of fun, and will serve their purpose later on. Killua leaves the game midway to take care of some \&quot;unfinished business\&quot;. What transpires(with him) during his short absence (*GAH! I must not spoil the OVA*) made him my absolute favorite character in Hunter x Hunter. You\'ll understand after watching the second episode of the OVA. I was worried that Gon and Killua were spending too much time on training and may have forgotten their goal of finishing the game but my fears were soon allayed. When they start collecting the cards, they really went all out. To be honest, a small part of me was very proud of them for doing all the card collection the \&quot;HARD\&quot; way (i.e. with no spoilers or information from other players). There are 3 key .. mini arcs that make this OVA great. They\'re not just great from a storyline perspective, but showcase subtle character development. It\'s so seamlessly done that the viewer won\'t feel that character development is being shoved down his/her throat. The first is the attempt(s) to get Tsubo of the Coast. All I can say is besides being totally hilarious, Razor rocks! The second is a FANTASTIC fight between Gon, Killua and Biske against the Bomber and his 2 buddies. I can\'t pick a favorite, all 3 were awesome! The third and last is the final card. It just goes to show that after all the action, it\'s the brains of a character that count the most. The ending made this OVA perfect. I have never read the manga but I did catch a glimpse of the hair color of the man in the last frame. Very ... interesting. 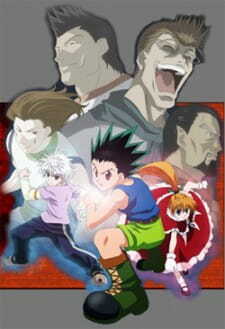 This is a definate must watch if you\'ve seen any Hunter x Hunter. Although Greed Island Final ties up the loose ends of OVA 3, there is still a lot that can be done. So far there have been 62 episodes of TV series, 8 episodes OVA1, 8 episodes OVA2 and 14 episodes of OVA3. That\'s 92 episodes. Is it enough? NOOO! We must have more! I for one will be waiting for the day when the manga writer comes back and finishes this series, so they can make more Hunter x Hunter anime for fans like us. Even though I\'m impatient for new stories to emerge, I will give 100% credit to the mangaka for writing this amazing series filled with action, comedy and friendship. Please finish the rest of the manga! before you judge me and think i'm going to only bash on Hunter x Hunter, i'll tell you right now, i'm not. the truth is, i really enjoyed the tv series and the first and second OVAs were good too. but this OVA disappointed me to such a degree i couldn't believe it, first off, the story, the story is just continuing Gon and Killua's journey on Greed Island, and this is going to finish it off. The story wasn't as good as the other parts of the Hunter x Hunter franchise because it was somewhat rushed to the conclusion, and there wasn't much development, more like just an appearance of powers with not too much effot. The art maintained from the series and other OVAs, not impressive, but good enough. The sound, personally didn't impress me, i didn't think Hunter x Hunter had a good soundtrack, not that it was bad, but it didn't make me want to listen to it again. Here is where the OVA truly fell short compared to the others. Gon and Killua were my favorite characters, but all of a sudden, Killua is kicked to the back burner, and becomes, i think, a little part of the story. and Gon, he started out as a naive boy that would never give up, until he couldn't go on, that's perseverance. But there's a thin line between that and stubborness, and he crossed it indefinitely. he started to bug me so bad, i actually wished he would lose a fight or something, knock sense into him, a character never annoyed me so badly, when at first they were one of my favorites. if you've watched the other Hunter x Hunter stuff, you'll notice the difference. enjoyment, i didn't enjoy it oo much, but enough to finish it, since i wanted some sort of closure. I loved and enjoyed the story, the game, the fights, the art, the sounds, the opening/ending, the characters, the final saddest moment at the end of the last episode when i realized that it was the end too. Any person who watched HxH should watch it or the remake HxH 2011. Ah, a masterpiece. Hunter x Hunter overall is just a blessing that keeps me glued to the screen and away from my responsibilities. This review is aimed at two groups of people: those who are planning to watch this after finishing the rest of the old adaptation, and those who have watched the new 2011 adaptation and are thinking about watching this. These are probably the two biggest groups of people looking into this OVA. The story is very similar, almost exactly, to the story of the manga or the new adaptation. For those who are watching it for the first time, it covers Gon, Killua, and Bisky's journey as they work towards finishing the game. There are a lot of complicated nen battles and in all honesty, it's best watched in one go. While this arc is one of the less popular and certainly not my absolute favorite (that would be Yorknew) it has a lighter feel to it than any of the arcs (excluding the exam arc) do. It focuses more on Gon and Killua's growth and the logistics of the complicated game, as well as the real advances in Gon's plan to find his father. Overall, I personally found it rather heartwarming and a really good training/growth arc for all the characters. Throughout the course of the OVAs, the art has only improved. Granted, it's still nothing compared to the 2011 adaptation, obviously, but it's gorgeous in a timeless way. Personally, even as someone who doesn't watch 'older' anime often, I forgot the animation was even 'outdated'. It's very smooth and detailed, and it's easy to tell how much effort went into it. In the beginning, the opening and closing seemed off to me and I didn't like them at all, but by the end of the 14 episodes, they had grown on me and I'd become attached. It's not music I would listen to on my own time, but it was something almost nostalgic and it will forever remain in my memory like a warm blanket. As for the background music, I think it was well done. Nothing ever seemed out of place to me. I think the characters and their growth were the most important to this arc overall. Hisoka is shortly at the front and center once more, but his ambiguity of character and swaying loyalties are highlighted in this OVA, creating another layer to him that warns the fans to never rely on him. Being a Hisoka fan, I've always appreciated this grey area of his character and enjoyed this aspect a lot. Gon and Killua undergo a lot of development as well. While some may argue that this is just a training arc, it's momentous for their relationship as they begin to trust eachother through anything (not that they didn't before) and grow in their abilities considerably. I've seen some argue that Killua, who was formerly much more powerful than Gon, has taken a lesser role in this OVA, but I think it suits his personality. He belongs in the shadows, he watches and waits, while Gon jumps ahead and is rather impulsive. That's how they work together, and that's what this OVA develops. I binged this in around a day, the only thing getting in my way being my other irl responsibilities, unfortunately. Despite having seen the 2011 adaptation, this was still such a fun ride, and there were even things I didn't expect, even the second time around. It was just very entertaining and heartwarming overall, and I would definitely watch this again and try to get more of my friends addicted to it.